If you place (with caution!!) an adult sea urchin on your hand (in sea water), you can see that all the spines are moving and between them there are many little tubular feet which stick onto your skin. The tubed-feet or podia are terminated by a sort of sucker and are used to move or grip rocks firmly: with these appendages and spine movements urchins 'walk'. Podia are extended by hydraulic pressure applied into an ampula located at their base, inside the perforated 'shell', which is called the TEST. It's not really a shell because it is covered by an epidermis. The TEST bears small structures like half spheres on which are articulated the base of each spine which can move in all directions like mechanical kneecaps. Each spine is made with many tiny rods of calcium carbonate as you can see in the lefthand picture. When you try to extract a spine from your skin with a needle, pieces of rods remain in the wound and can cause abscesses later. Between the spines and often easily visible near the mouth, are located 'three jawed forceps' called pedicellaria, which are used by the urchin to clean the epidermis and grasp food particles. I have found two or three broken pedicellaria in water, after washing urchins to collect eggs. I have been astonished to see one of them was continuing to move and trying to grasp some eggs, many hours after! (In the righthand picture below, the arrow shows an egg crushed by the forceps: image quality is poor because it has been extracted from video footage). 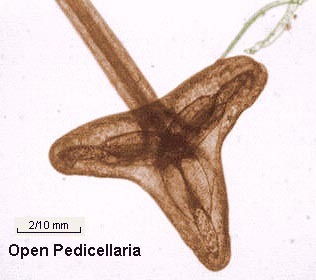 The pedicellaria, which has a flexible stalk fixed on a rigid calcareous pedicle at its base, is covered with vibrating hairs which are probably used like sensitive organs to locate intruders and expel them; indeed sea urchin 'shells' are always found clean without any larvae or algae attached. Click here to see a video clip of this amazing jaw (shown above right) in action. (Clip 790kB, mpeg). In the lefthand picture, an intriguing internal structure appears in the jaw when I was looking at an open pedicellaria; I noticed that a sort of sharp spine was inside. With a drop of an oxidising chemical (DAKIN'S solution: a chloride solution normally used for skin disinfecting) soft tissues can be removed. Don't use a coverslip, because some chlorine bubbles appear. (Diluted bleach works well probably but it contains sodium hydroxide which is more corrosive). The pictures below show three amazing tiny bones; each with one long spine and three smaller ones. Note all the holes in them. On the same specimen another type of pedicellaria is present: its shape is different - more elongated and larger with very little 'teeth" for a more precise action. (Pictures below right were from subjects processed with DAKIN'S solution). 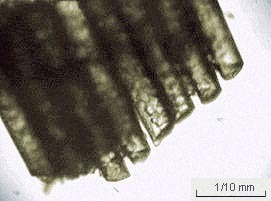 The same oxidising process may be used on a broken podia for example. Each one is terminated with a bone structure looking like a four-petalled flower containing a thin network of chalky rods. It works probably like arubber-tipped dart (i.e. the children's game) by the deformation of structure, creating a vacuum effect; indeed the centre of the sucker seems to not have a hole. 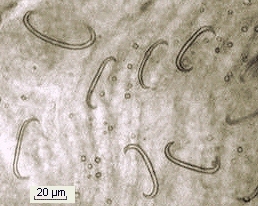 A piece of podia tube often remains attached to a sucker: after tissue dissolution, the podia wall appears to be reinforced by little "C" shaped spicules. But as you can see in the lefthand picture, they are few in number. An urchin's mouth is located on the bottom (flat) side of the test with five teeth moved by 60 muscles. Teeth are used for scraping algae from rocks. It's also a good subject to observe with a stereo microscope on a living sea urchin (left in seawater during observation); deployed podia are also visible. The mouth's complex structure is called 'Aristotle's lantern' because Aristotle describes it from Greek Antiquity. After your studies don't forget to release the subject: even with some podia or pedicellaria broken, a sea urchin is always still alive ! Note: if you want to make permanent mounts either of urchin larvae after the pluteus stage or of little bones, DON'T use acid fixative (like acetic acid or BOUIN'S picro-formalin containing acetic acid), because chalky parts are dissolved by acid and the subject become slack!